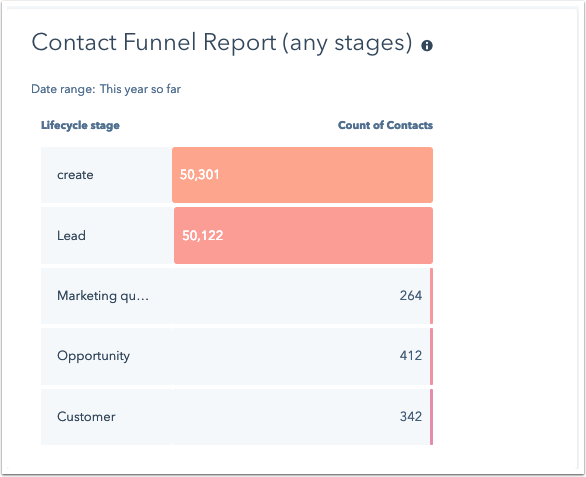 You can create and add funnel reports to your dashboard to monitor your sales and marketing team's progress. When building a funnel report, there are two different report types you can select, and they measure data differently. The Show contacts/deals that have gone through all stages option shows the number of contacts or deals in each stage that moved through the selected stages in order. For example, if a contact was created, became a subscriber, then went straight to customer without ever becoming a lead, the contact will be reflected in Created, and Subscriber, but not Customer in the example below. You will also see calculated conversion rates at each lifecycle stage which show the percentage of contacts who moved from one stage to the next. Use this type of report if you want to track a specific progression of lifecycle and deal stages. The Show contacts/deals that have gone through any stages option shows the number of contacts or deals that have had any of the selected lifecycle or deal stages, regardless of the order they moved through each stage. For example, if a contact was created, became a subscriber, then immediately became a customer without first becoming a lead, the contact will count toward the Created, Subscriber, and Customer columns in the example below. Use this type of report if you want a general report of the various stages that your contacts and deals move through. Learn more about creating custom reports.